Not to be confused with Thai language or Tai language (New Guinea). The Tai or Zhuang–Tai languages (Thai: ภาษาไท or ภาษาไต, transliteration: p̣hās̛̄āthay or p̣hās̛̄ātay) are a branch of the Tai–Kadai language family. 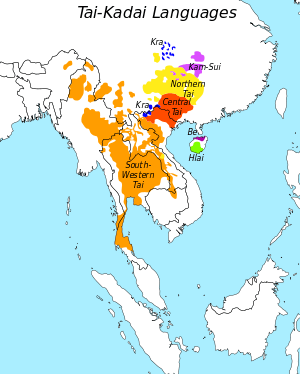 The Tai languages include the most widely spoken of the Tai–Kadai languages, including standard Thai or Siamese, the national language of Thailand; Lao or Laotian, the national language of Laos; Burma's Shan language; and Zhuang, a major language in the southern Chinese province of Guangxi. Cognates with the name Tai (Thai, Dai, etc.) are used by speakers of many Tai languages. The term Tai is now well-established as the generic name in English. In his book The Tai-Kadai Languages Anthony Diller claims that Lao scholars he has met are not pleased with Lao being regarded as a Tai language. For some, Thai should instead be considered a member of the Lao language family. One or more Ancient Chinese characters for ‘Lao’ may be cited in support of this alternative appellation. Some scholars including Benedict (1975), have used Thai to refer to a wider (Tai) grouping and one sees designations like proto-Thai and Austro-Thai in earlier works. In the institutional context in Thailand, and occasionally elsewhere, sometimes Tai (and its corresponding Thai-script spelling, without a final -y symbol) is used to indicate varieties in the language family not spoken in Thailand or spoken there only as the result of recent immigration. In this usage Thai would not then be considered a Tai language. On the other hand, Gedney, Li and others have preferred to call the standard language of Thailand Siamese rather than Thai, perhaps to reduce potential Thai/Tai confusion, especially among English speakers not comfortable with making a non-English initial unaspirated voiceless initial sound for Tai, which in any event might sound artificial or arcane to outsiders. Citing the fact that both the Zhuang and Thai peoples have the same exonym for the Vietnamese, kɛɛuA1, Jerold A. Edmondson of the University of Texas, Arlington posited that the split between Zhuang (a Central Tai language) and the Southwest Tai languages happened no earlier than the founding of Jiaozhi in Vietnam in 112 BCE but no later than the 5th–6th century. 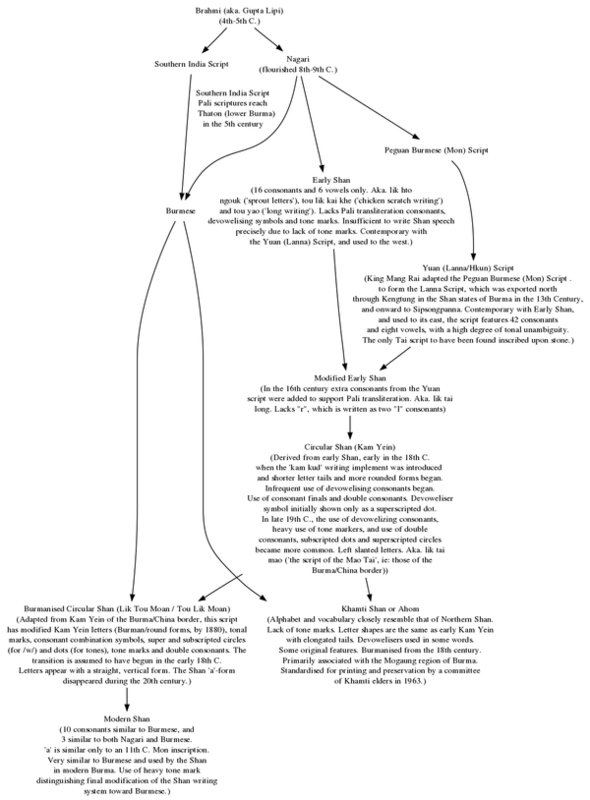 However, based on layers of Chinese loanwords in Proto-Southwestern Tai and other historical evidence, Pittayawat Pittayaporn (2014) suggests that the separation between Proto-Southwestern Tai and Proto-Tai must have taken place sometime between the 8th–10th centuries. Gedney (1989) considers Central and Southwestern Tai to form a subgroup, of which Northern Tai is a sister. 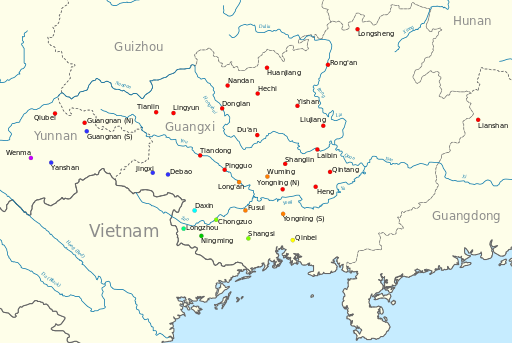 Standard Zhuang is based on the dialect of Shuangqiao (双桥), Wuming County. Proto-Tai has been reconstructed in 1977 by Fang-Kuei Li and by Pittayawat Pittayaporn in 2009. Proto-Southwestern Tai has also been reconstructed in 1977 by Fang-Kuei Li and by Nanna L. Jonsson in 1991. Many Southwestern Tai languages are written using Brāhmī-derived alphabets. Zhuang languages are traditionally written with Chinese characters called Sawndip, and now officially written with a romanized alphabet, though the traditional writing system is still in use to this day. ↑ Hammarström, Harald; Forkel, Robert; Haspelmath, Martin; Bank, Sebastian, eds. (2016). "Daic". Glottolog 2.7. Jena: Max Planck Institute for the Science of Human History. ↑ Diller, 2008. The Tai–Kadai Languages. 1 2 3 4 5 6 Diller, Anthony; Edmondson, Jerry; Luo, Yongxian (2004). The Tai-Kadai Languages. Routledge (2004), pp. 5-6. ISBN 1135791163. ↑ Ferlus, Michel (2009). Formation of Ethnonyms in Southeast Asia. 42nd International Conference on Sino-Tibetan Languages and Linguistics, Nov 2009, Chiang Mai, Thailand. 2009, p.3. 1 2 Pain, Frédéric (2008). An Introduction to Thai Ethnonymy: Examples from Shan and Northern Thai. Journal of the American Oriental Society Vol. 128, No. 4 (Oct. - Dec., 2008), p.646. ↑ A1 designates a tone. ↑ Pittayaporn, Pittayawat (2014). Layers of Chinese Loanwords in Proto-Southwestern Tai as Evidence for the Dating of the Spread of Southwestern Tai. MANUSYA: Journal of Humanities, Special Issue No 20: 47–64. ↑ Haudricourt, André-Georges. 1956. De la restitution des initiales dans les langues monosyllabiques : le problème du thai commun. Bulletin de la Société de Linguistique de Paris 52. 307–322. ↑ Pittayaporn, Pittayawat. 2009. The Phonology of Proto-Tai. Ph.D. dissertation. Department of Linguistics, Cornell University. ↑ Unless indicated otherwise, all phonological shifts occurred at the primary level (node A). ↑ Unless indicated otherwise, all phonological shifts occurred at the primary level (node D). ↑ Also, the *ɯ:k > *u:k shift occurred at node A. ↑ For node B, the affected Proto-Tai syllable was *we:, *wo:. ↑ For node C, the affected Proto-Tai syllable was *we:, *wo:. Li, Fang-kuei. 1977. Handbook of Comparative Tai. Honolulu, Hawaii: University of Hawai’i Press. Østmoe, Arne. A Germanic-Tai Linguistic Puzzle. Sino-Platonic papers, no. 64. Philadelphia, PA, USA: Dept. of Asian and Middle Eastern Studies, University of Pennsylvania, 1995.